I have enjoyed going to Annie's Music Together classes with my youngest son since 2013! All 3 of my children have done Music Together at different Tokyo locations over the years, and I personally have loved it so much that I took the teacher training in 2015 to really understand the philosophy properly. 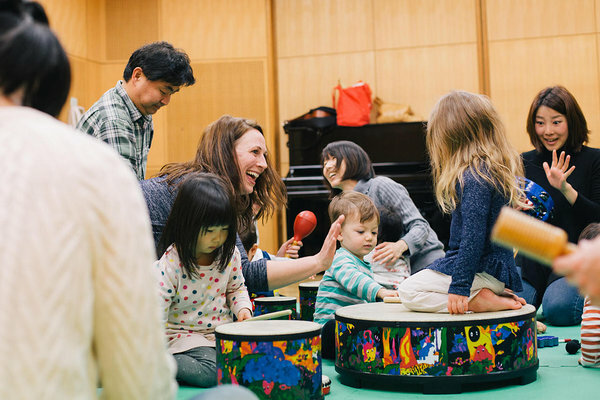 Annie's Music Together classes are a really important part of each week for me and my son - it's our time to connect and bond while my other children are at school, and it's been great to see how music makes him smile. I can't recommend Annie's classes enough. Of all the various activities I've tried and tested with all my children, Music Together has been the one that has remained constant throughout!! Annie Sensei is warm, welcoming and very engaging! Her classroom is filled with music, dancing and bright smiles. I enjoy that one on one time with our little girl; singing along and dancing with her. The songs that we learn in class are sung daily outside of class - it's fantastic! It's also a great chance for moms to connect with other moms. I've made wonderful friends through ALBA Music Together. I can't recommend ALBA Music Together enough. Come join us!! !